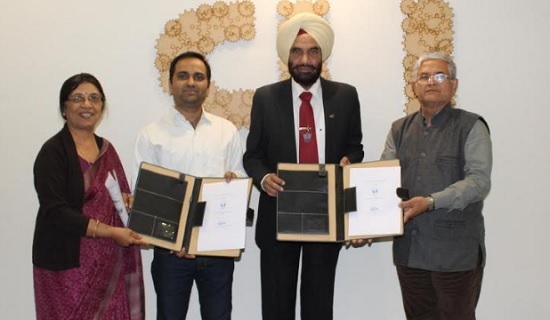 Jaipur : Bhartiya Skill Development University (BSDU), Jaipur, on Tuesday, announced MoU with India’s first 3D Printer developer and a startup company Aha3D Innovations. Under this partnership, Aha3D Innovations is setting up 3D Printing Lab and going to train the BSDU’s students on making of 3D Printers, in its first phase. In the second phase, the MoU envisages utilization of the strength of students to manufacture the 3D Printers of various models for Indian market. In the third phase, one R&D Center on 3D printing will be set-up for the students at the BSDU Campus. The application of 3D Printing is in high demand in the industries like manufacturing, construction, IT, education, arts, automotive, fashion and consumer electronics. With this MoU, BSDU and Aha3D Innovations have also envisaged to build country’s largest 3D printer, of build volume 2.5 X 2.5 X 2.5 m at the campus by the students.